I was charged with falsifying or forging class records. What does that mean? Helping your friend out and signing them into class or lab. Playing as your friend in a class polling assignment for credit. Noting time on an internship log that you did not complete. Noting dates and time on a lab attendance record when you were not there. What happens if I was caught falsifying my class records? Check your universities procedure for academic dishonesty violations. Generally, students are allowed to defend themselves against forgery accusations. It may happen between just you and the professor or in front of an honor code committee. 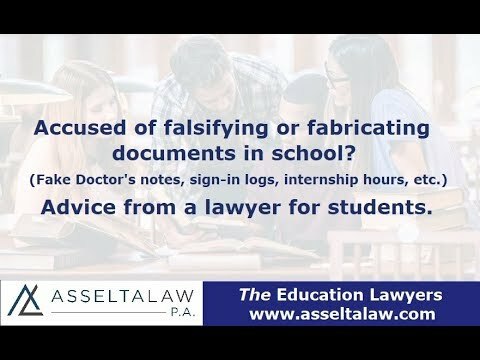 What can happen if I am found responsible for fabricating school documents? You will receive a sanction. Sanctions can range from a warning up to dismissal and expulsion from your university. Can I appeal a disciplinary sanction? Yes. A disciplinary appeal is typically a written submission with only a few categories to argue in. The most common student appeal categories are new information, harshness of sanction, and policy violations. I write appeals for students using my extensive background as an appellate attorney and specialized knowledge of the academic disciplinary process. Can you help me defend my honor code charge? Yes. I offer student defense advising services throughout the United States. Using my nearly twenty years as an attorney with a specialized knowledge of the academic integrity process, I assist students to gain successful outcomes. Richard Asselta is an award-winning student defense lawyer who offers student defense services throughout the United States. He is experienced in defending all types of college disciplinary issues, including falsification.